This Italian “S” Cookie was handed down to me from my Grandmother. My family makes batches of them every December. Christmas wouldn’t be Chistmas without this recipe! Using a stand mixer or electric mixers, cream butter and sugar. Add eggs, sour cream, and vanilla. In a separate bowl mix together the dry ingredients. Then add the dry ingredients to the wet ingredients and continue mixing til well combine. Dust work surface with flour and, using your hands, roll a rope out of the dough. 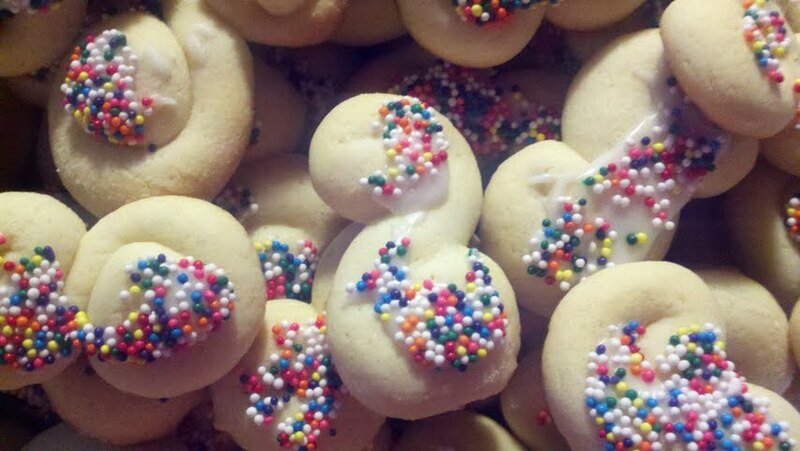 Use about a 3-4 inch piece of rope to form an “S.” Place cookies on a greased baking sheet and bake at 350 for about 10 minutes. For the icing mix about a cup of confectioners sugar with a few drops of anise and a few drops of water so it is an icing-like consistency. Spread over cooled cookies then dip in sprinkles. Yes. My family loves frozen cookies. These freeze well. This recipe could use more instructions.